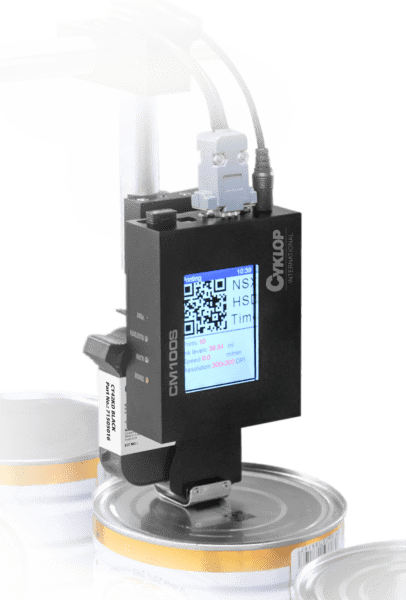 The Cyklop CM 100S is a high resolution TIJ printer with an interchangeable cartridge system and is ideal for encoding products and/or packaging materials. This new printer is based on the proven CM 100. The CM 100S is equipped with an anti-shock system and a new slide head, making it possible to print on curved and uneven surfaces. Using the design software and intuitive user interface, this printer offers the ability to quickly produce neat and individual packages. Printing information as text, date, time, logo, and barcodes is possible with a high resolution of up to 600 dpi.